and the wheel of Karma turns no more." For almost ten years, we had the great joy of hosting Swami Paramanand Ji as he offered annual meditation retreats at the House of Mica. At this time, Swami Ji does not have any plans for future trips to the US. Therefore, to sit with him in person, we have to travel to India. 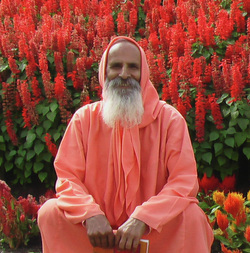 If you are interested in being part of a trip to India to sit with Swami Paramanand Ji at his ashram in Haridwar, please contact us. We have visited this ashram several times and will plan all aspects of the trip, including time with Swami Ji, travel within India, etc. Haridwar is a sacred city located along a very beautiful section of the Ganges River and our trips will include an opportunity to bathe in this holy river. The ashram is a very beautiful place with accommodations that are comfortable for folks from the US. Below is a short slideshow of the ashram and surrounding area of the Sapt Sarovar section of Haridwar.